Hysterical Comedy “Oh Hello” on Bway! One of the funniest shows I’ve ever seen on Broadway totally surprised me with its’ non-stop hilarity. It’s “Oh Hello” and there’s only two people in it! 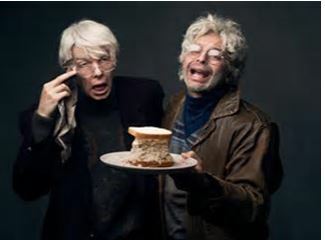 But they are the super superb sketch comedians Nick Kroll and John Mulaney, who appear as their 70-something alter egos Gil Faison and George St. Geegland. Whether they are a gay couple or not is open to interpretation. The show was described as “very gay” to me, and it is, and it isn’t. 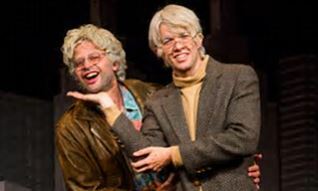 This is simply the story of two old men, who have lived together for over forty years in the same rent-controlled apartment on the Upper West Side ,”the coffee breathe of New York”, they call it. And they get an eviction notice in Act One. Except there is no intermission so there is no act one. George sports wide wale corduroys that look like they were once brown, but are now sort of purplish with a shine. There’s no shine on his shoes because he is wearing sandals with not-so-white socks. They both look like they need a good bath, but there is no indoor plumbing visible or referred to. You can almost smell them from the front of house. George is still trying to get his plays done. Largely to no avail, and he wouldn’t appear so preposterous a character, if he didn’t resemble Florence Foster Jenkins’ real life husband/companion in the recent Meryl Streep movie “Florence Foster Jenkins.” That foppish St. Clair Bayfield was played by Hugh Grant in the movie. A real-life failed 1920s actor, he married money. 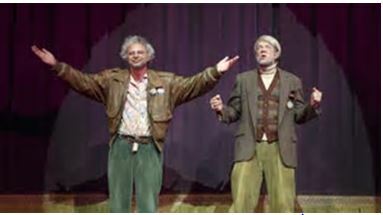 But George St. Geegland and St.Clair Bayfield, they are cut from the same fading theatrical cloth. Except that George has no money and Gil has even less. You wonder how they manage at all at their advanced ages to pay their $75 a month rent. So the eviction notice heralds disaster .But they ARE spry, and as embodied by the 30-something comic geniuses of Nick Kroll and John Mulaney, you love them to pieces. There is not one comic beat that is missed. Their malapropisms are monumental. Broadway is pronounced “Brid-way,” a phone call is a “finn-call” and an homage is a “Home-page.” But they try and try to get into show business, still, and their constant rejection is our comic bonanza. Their big “Brid-way” break is just around the corner, and Nathan Lane is off-stage waiting to come on, they assure us. They have a favorite diner on the Upper West Side, but can’t remember its’ name, but they do remember that their menu has “fourteen plastic pages” and that one of the dishes is lobster. “I was going to order that,” says Gil, “Just to see what would come out.” Mainly they venture outside to get throw aways from “Brid-way bombs. There’s so much to choose from.” The entire scrim from “Fiddler on the Roof”(which is still running BTW. How did they get it?) comes down, and they have to act through its’ gauziness towards the end of what would’ve been Act Two. Adam Driver (of “Star Wars:The Force Awakens”) was the celebrity guest the night I was there and I’m still shaking with laughter. The theater was suddenly filled with screaming teenage girls in the second and third balcony, and they wouldn’t stop shreiking as George, Gil and Adam sat down at their checkered red and white diner dining table for an interview. It got so bad, Gil just yelled at them “SHAD-DUP!” And they did. Only slated at the moment to run through January, catch them now, while you can. It’s the perfect New York holiday show for misanthropes.